The JCPS Summer Learning with Community Partners Initiative intends to provide additional learning supports for students attending community-based summer learning programs for both literacy and numeracy at no cost to the community partner group. JCPS’ vision is to provide 20 days of programming for students with at least 75 minutes per day in supplemental reading and at least 75 minutes per day in supplemental math support. This support is in addition to services already provided by the community partners. JCPS will work to match partners groups with teachers appropriate to grade level participants. Once matches have been made, the JCPS staff will work directly with the community partner group to ensure a successful summer experience for the partner, the district, and the students. Decisions will be made by 2/15/19 and programs will be notified by 3/1/19. A representative from JCPS may be reaching out to applicants for additional information in February, if needed. • Quality out-of-school time (OST) is central to youth success today, and BLOCS has expanded from 38 to 77 sites serving 2,400 youth across the community. Further, it has improved program quality across the BLOCS OST network by 13% in three years. • Introduced Louisville’s first-ever professional Youth Development Certification. Developed in partnership with Jefferson Community Technical College, it has enrolled 140 youth workers since its start in 2016. • Partnered with JCPS on expanding the district’s CASCADE data system to enable OST programs to track OST attendance. This data tracking system is now used by 100 OST providers. These are just a few of the numerous accomplishments BLOCS has spearheaded to help improve outcomes for young people. And we’re just getting started! 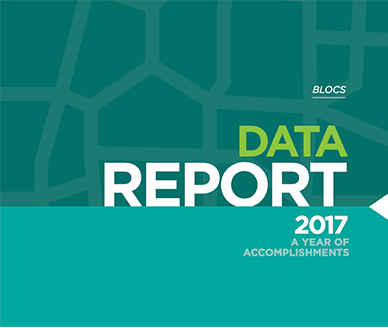 This report outlines quality improvement data and youth outcomes data from 2014-2017 for all program sites in the BLOCS network. Information includes OST participation levels in Louisville’s Zones of Hope, program quality assessment data, social-emotional learning (SEL) results, and recommendations. Research shows that social-emotional learning (SEL) may be better indicators of youth success than academics. BLOCS is modeled on the premise that frequent, regular attendance at high-quality OST programs positively impacts the acquisition of social-emotional skills, and is linked to higher school engagement and academic performance. In fact, BLOCS data indicates a statistically significant link between participation in high quality OST programs and fewer school suspensions. Social-emotional learning is reported at the program level, as measured by tools such as the Survey of Academic and Youth Outcomes (SAYO-Y) and Staff Rating of Youth Behavior (SRYB). SAYO-Y is a research-based tool developed by the National Institute of Out-of-School Time (NIOST) to measure youth program experiences and SEL at OST programs. Data is self-reported by the youth engaged in OST programs. The SAYO-Y Measurement Areas include Program Experiences, Sense of Competence, and Future Planning & Expectations. The SRYB is a different survey, completed twice per year by youth workers based on their experiences with and observations of individual students. Both tools are an excellent source of SEL data on youth who attend OST programs. 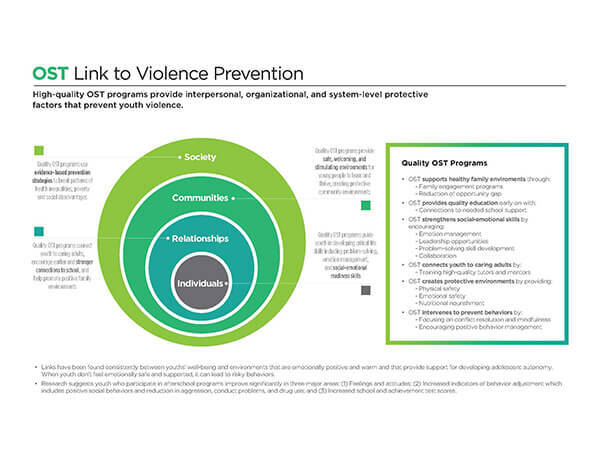 OST is a Violence Prevention Strategy! OST can have a strong, positive impact on violence prevention. Adolescent mental and emotional well-being is associated with teens’ environments. Links have been found consistently between teens’ well-being and environments that are emotionally positive and warm and that provide support for developing adolescent autonomy. When youth don’t feel emotionally safe and supported, it can lead to risky behaviors. • Afterschool programs improve academic performance, social and developmental outcomes, contribute to healthy lifestyle options, and prevent many risky behaviors. • Kids left unsupervised three or more days per week were twice as likely to hang out with gang members and three times as likely to be engaged in criminal behavior, and more than three times as likely to use illegal drugs. 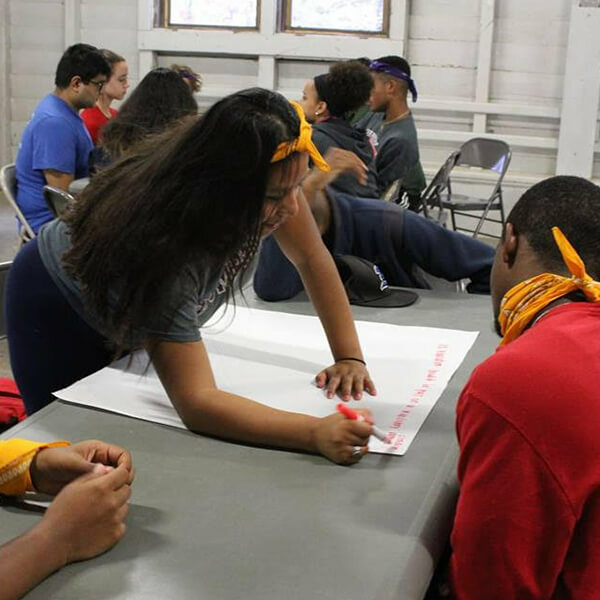 • Research suggests youth who participate in afterschool programs improve significantly in three major areas: (1) Feelings and attitudes; (2) Increased indicators of behavior adjustment which includes positive social behaviors and reduction in aggression, conduct problems, and drug use; and (3) Increased school and achievement test scores. • The kinds of hands-on experiences and opportunities to lead that take place in OST programs teach youth important skills like teamwork, collaboration, compromise, communication, and perseverance…not giving up when a task gets difficult. Building resiliency, confidence and self-worth leads to less risky behaviors. 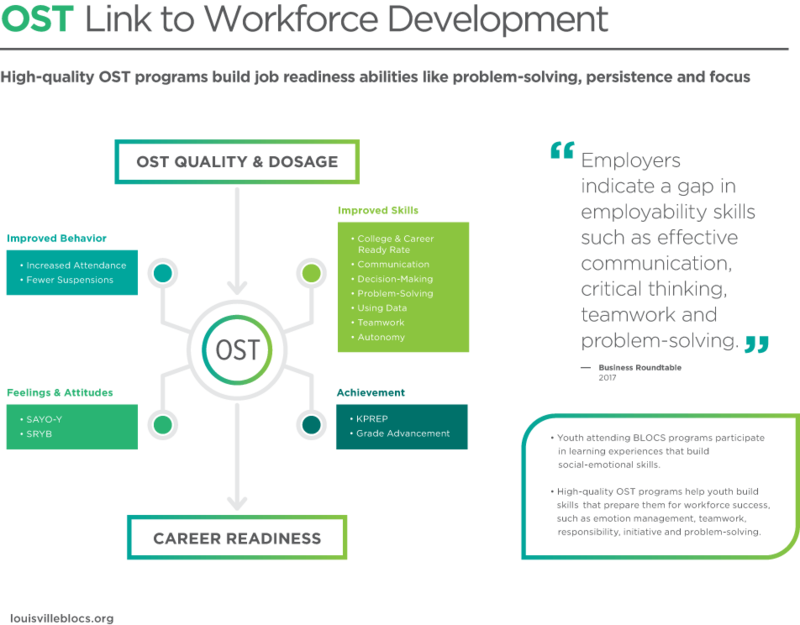 OST is a Workforce Development Strategy! Workforce development is another critical area in the community where OST can have a strong, positive impact. In addition to improving basic reading, writing, and math skills, workers also need to develop skills in communication, resource allocation, decision making, problem-solving, and using data. 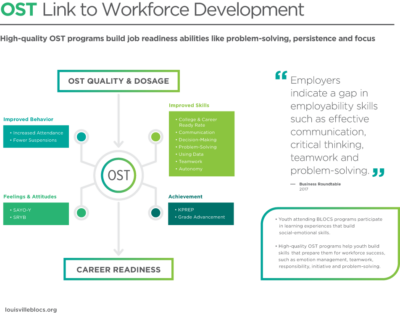 OST provides youth with opportunities to develop these kinds of abilities and skills that the GED doesn’t test for and that academic classes don’t fully prepare them for—things like higher-ordered thinking, organization and communication skills. Youth need these life capacities as adults, in order to meet demands, confront challenges and lean into opportunities. OST provides supervised, safe, and engaging environments (environments that are emotionally positive and warm and that provide support) where they can practice, develop and master these skills over time. These positive environments look like: personal attention from adults, a positive peer group, and activities that hold their interest and build their self-esteem. Within this context, quality OST programs provide leadership opportunities such as community service, youth councils, opportunities to design or lead activities, and paid youth staff positions. These are the kinds of real world examples, applications and experiences that build transferrable skills like communication, problem solving, and teamwork.